The Federal Reserve left interest rates unchanged and signaled growing confidence that inflation is inching closer to its goal. The Fed unanimously agreed on Wednesday to keep rates unchanged following a two-day policy meeting in Washington. Policy makers pointed to fewer Americans out of work and strong growth in business investment. 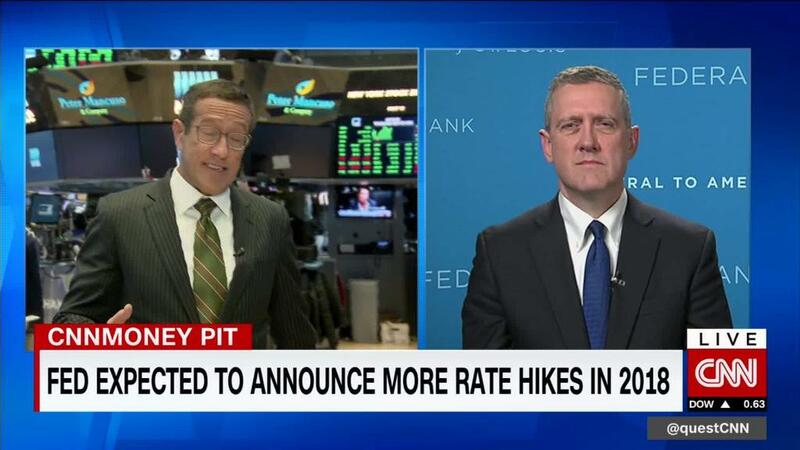 They also said that inflation is moving closer to the Fed's 2% target. All are signs that the economy is still getting stronger. "Risks to the economic outlook appear roughly balanced," the Fed said in its policy statement. The federal funds rate, which helps determine rates for mortgages, credit cards and other borrowing, remained at a range of 1.5% to 1.75%. The Fed has lifted rates six times since December 2015. But investors widely anticipated that policy makers would hold off on lifting their benchmark rate at Wednesday's meeting, despite the rosier economic outlook and an uptick in inflation. The Fed is trying to strike a careful balance: It wants to raise interest rates steadily to keep the economy from overheating, but raising rates too quickly could help start a recession. Economists expect the Fed to nudge rates higher in June. For now, the Fed has penciled in three rate hikes this year, and three more in 2019. But investors are looking for signs that the Fed might speed up those plans. Investors will be looking for clues in about three weeks, when the Fed releases the minutes from its May meeting, and at the Fed's next meeting June 12 and 13. In the meantime, Fed officials have begun to debate publicly how close the economy is to overheating. Forecasts of higher growth and a recent uptick in inflation could lead Fed officials to raise rates faster than previously telegraphed.